Too freakin’ weird. 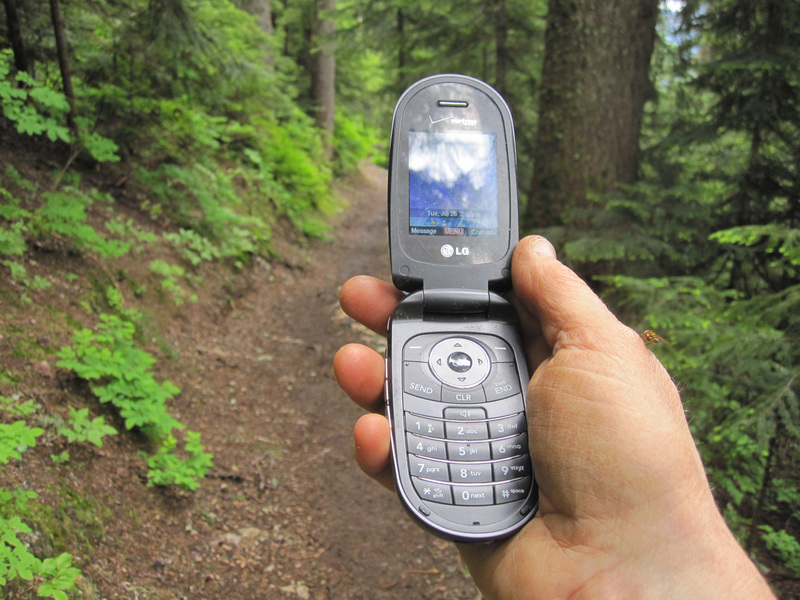 Here I am on the Pacific Crest Scenic Trail (a national treasure) using a cellular telephone for work. My employer gave me this digital object so that I can conduct business the way the rest of the world does these days. I’ve been resistant of course, because I want to keep my reputation as a knuckle-dragger. But where we were today…not possible to use the radio system to communicate, but the cell phone worked. It does not seem right to be in the woods talking on the phone. I go to the woods to get away from pervasive gadgetry and extraneous information-sharing. Most of what I have to say can be said face-to-face with my colleagues, or it can wait. This week I’ve been coordinating a large project and I have to confess that the damn phone has been handy. I don’t have a personal cell phone. When people first started using them, I noticed a direct correlation between frivolous phone conversations in public places and the proliferation of towers messing up the landscape. We have scenery around here, and I became quite the NIMBY (Not In My Back Yard). Might as well try to stop a tidal wave. Perspective has changed since we now have wind farms that make a few cell towers look puny and insignificant. I accept that the scenery has been compromised, but I don’t have to like it. Over the weekend I heard someone say on a radio program that all of our digital technology is changing our perception of time. I’ve been chewing on that thought, and I would add that our sense of space changes too. How does time change when we can talk to someone instantly, rather than waiting till we get down the trail? Did it save time to call from the trail and have my boss pick up the 6 inch spikes I needed? They were on my desk this morning before I headed for the woods. What other activity filled the time I would have spent getting the spikes myself? Does instant communication make me more efficient, or does it just make me busier? Do the woods feel far away, or does the fact that I can call anywhere make them smaller and closer to everything? I’ll think about this some more. At least there’s still time to think on the trail while I walk. Like most things, I reckon technological marvels have both uses and detriments.